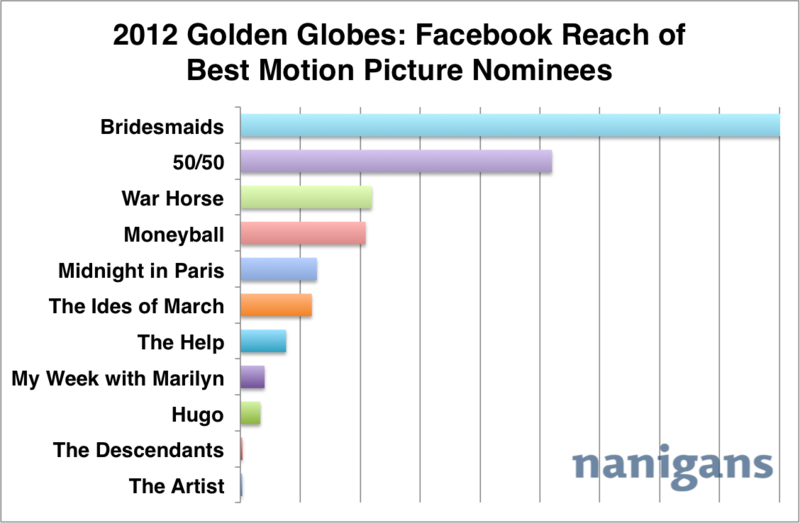 2012 Golden Globes: Which Best Motion Picture Nominees Win on Facebook? The Hollywood Foreign Press Association just released their official list of nominees for the 69th Annual Golden Globe Awards. Since the formal 2012 Golden Globes won’t be held until January 15th, we decided to turn to Facebook to determine the winners today. We pit the Best Motion Picture nominees for Best Drama (6 films) and Best Comedy/Musical (5 films) against one another to see which have captured the hearts and minds of Facebook users in the United States. And if Facebook were the judge, Bridesmaids would win the Golden Globe for Best Motion Picture – Comedy/Musical, hands down. 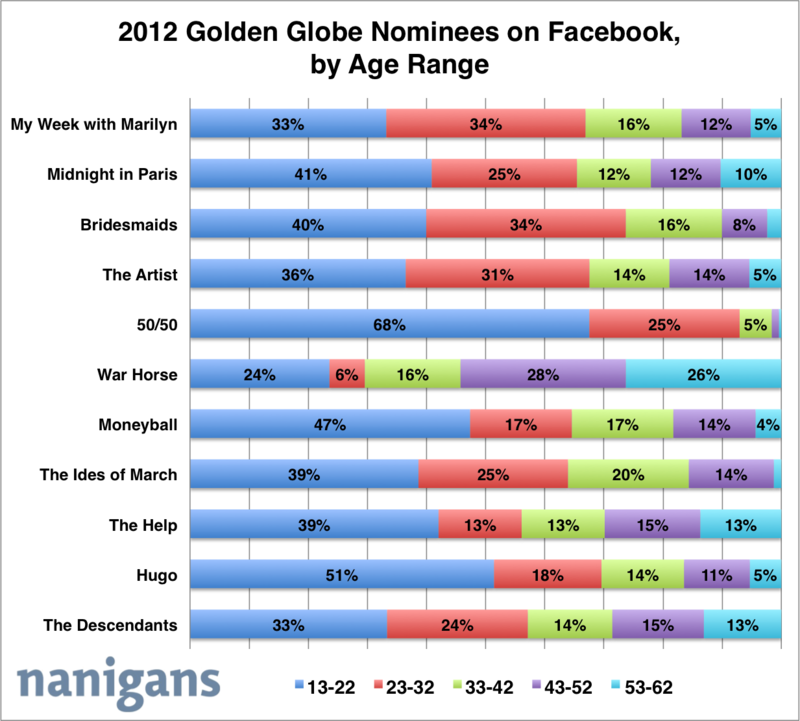 Bridesmaids has nearly twice the Facebook reach of the next most popular nominee, 50/50. As for Best Motion Picture – Drama, Moneyball comes out as the winner with The Ides of March as runner up. Interestingly, the two films with the greatest number of total nominations from the Hollywood Foreign Press Association this year, The Artist and The Descendents (6 and 5, respectively), fall at the bottom of the list. Curious as to who is most interested in each of these nominees? We drilled into the demographic composition of Facebook users interested in each of these films. The majority of people touting interest in these films on Facebook are younger. 50/50 has the most dramatic composition on this front, with 68% of its interest base between the ages of 13-22. On the opposite end of the spectrum is War Horse, with only 24% of its interest base between the ages of 13-22 and 59% of its interest base between the ages of 43-62. As you can see from above, the majority of people interested in these Golden Globe nominees on Facebook are female. Moneyball is the one exception, with 51% of its interest base on Facebook being male. 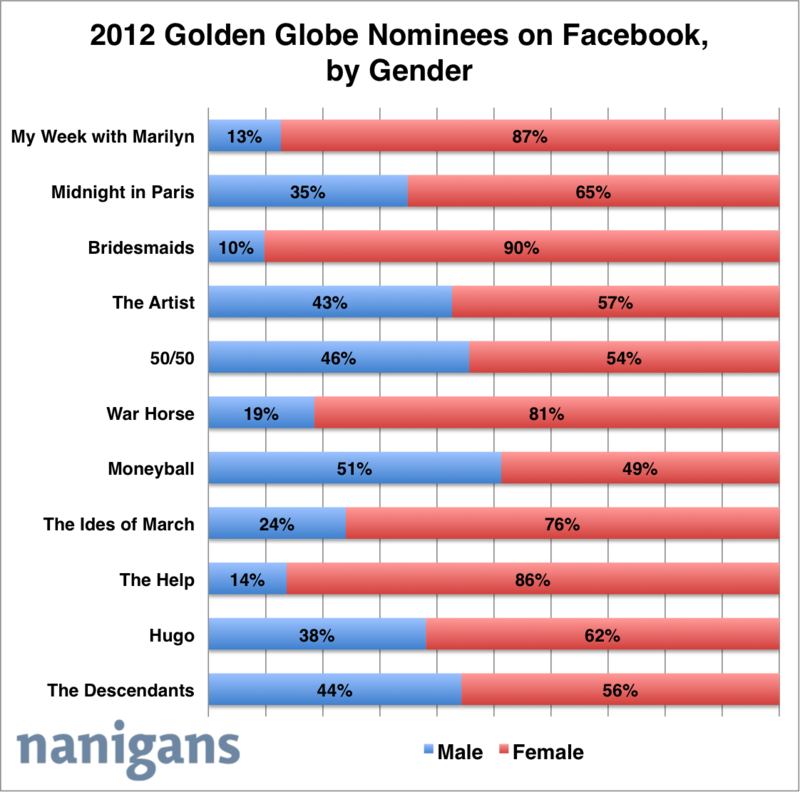 As for the nominees that resonate most strongly with females, Bridesmaids, My Week with Marilyn and The Help each have over 85% female interest bases on Facebook.